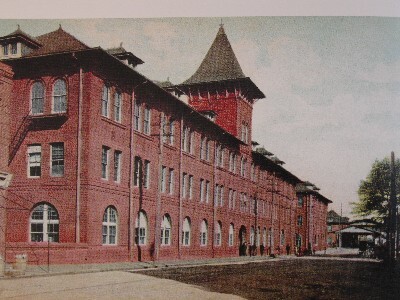 William Bleddyn Powell was the architect of the 1887 Atlantic Coast Line office building in Wilmington. As the ACL complex expanded, this building became known as Building "A". This structure, though its edifice was enlarged later, maintained the Romanesque style of the original design. The 1 July 1887 issue of The Wilmington Daily Messenger praises the design as "A handsome edifice of splendid architectural design embodying spaciousness, safety, strength and durability". A summary of its architectural features can be derived from this newspaper article and a second article in the same publication that appears on 13 July 1887: 1) Foundation - "The foundation of the exterior walls [was] three and one half feet thickness of ten inch timber, which are placed crosswise situated eight feet below the basement floor; 2) Foundation Piers- each pillar consists of two piles with two pieces of lumber twelve by twelve running the entire length of the building on which are built brick pillars two by eight capped with a square piece of granite ten inches thick; 3) Footings - The posts are placed in a cast iron footings on the foundation; 4) Wall Thickness - The outside walls were two feet and three inches thick at the base and twenty and one-half inches at the eaves. The Front Street walls are thicker to resist the pressure of the earth of the street. A two-inch space inside the wall acts as a dampness barrier. Ties were one-quarter by one-inch galvanized iron that had been dipped in coal tar; 5) Brick Used in Walls - The rear wall was built with Richmond paving brick and the remaining walls were built with Richmond pressed brick. Peerless Brick Company manufactured the molded bricks; 6) Woodwork - The interior woodwork was oiled and varnished yellow pine; 7) Roof - The rise of the roof was sixteen and one-half feet. It was covered by slate from Buckingham Quarry in Virginia. The roof was ornamented with a terra cotta creston; 8) Chimneys - The chimneys were capped with Maryland Brown Stone; 9) Entrance - The stringers for the arch at the entrance were cut from Contentnia (Contentnea) granite from Wilson (North Carolina); 10) Architect - Mr. W. Bledyn (Bleddyn) Powell, of Philadelphia, who made the design for the new depot of Richmond, Va., who is now architect of the Pennsylvania Railroad Company, and has designed many of their handsomest depot buildings; 11) and, Approximate Cost - The 13 July 1887 issue of The Wilmington Messenger gives the cost to be about $30,000. Transcripts of the two articles from The Wilmington Messenger were sent to The Pennsylvania Railroad Technical and Historical Society and the Literature & History Department of the Richmond Public Library. Both organizations responded promptly. The archivist at The Pennsylvania Railroad Technical and Historical Society stated that there were not any records on individual employees in their collection, but he would pass the articles on to an expert at the University of Delaware. The expert sent a citation from the Biographical Dictionary of Philadelphia Architects in the 19th Century. According to this citation, William Bleddyn Powell (1854 - 1910) working in the Pennsylvania Railroad's Engineer of Bridges and Buildings office was second to John McArthur, the designer of Philadelphia"s City Hall and City Architect of Philadelphia. He finally retired in 1909. Some of the stations he designed were those at Harrisburg, stations along the Chestnut Branch, and the Charles E. Pugh House in Overbrook. The citation also included references to the Byrd Street Depot and Freight House in Richmond. The research librarian sent a number of newspaper articles and a photocopy of a period photograph of the station. 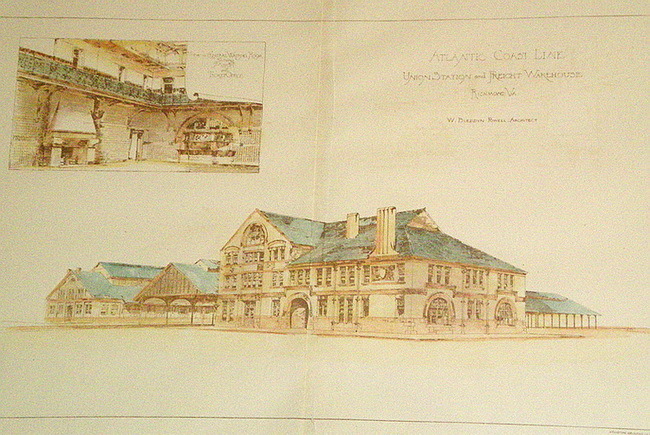 The design elements of the Richmond Depot appeared remarkably similar to those of the ACL Building "A" and "B" in Wilmington. One newspaper article from the Richmond News Leader dated 31 January 1956 includes a brief history of the site. The article mentioned that the building ceased to serve the function of depot after 6 January 1919. An accompanying photograph of the building in the process of being remodeled as a one-story structure was included. A 22 March 1973 Richmond times-Dispatch article features a photograph of the station's massive fireplace. However, the article is about the demolition of the building due to the extension of the 9th Street Bridge. It appears that more of Mr. Powell's work has suffered the fate of countless architectural treasures. It was in the way of somebody else's definition of progress. In a bulletin published in 1954 by the North Carolina Department of Conservation and Development entitled The Commercial Granites of North Carolina and written by Richard J. Council, the text indicates that there was a granite quarry near Elm City north of Wilson. The quarry was located along the railroad; and the stone had been quarried at that site intermittently since the 1850s. A resident of the area living near the quarry gave a small sample of this granite from his yard to the author of this article. It was given to the New Hanover County Library.